This is a story that gives you a deep insight into the psychology behind serial killing. Piyush Jha has already made his name into the bookshelves being the author of bestselling crime thrillers. Being an acclaimed film director, his films Chalo America and Sikandar have been appreciated for their unconventional themes. The book in hand is his fourth in the series of the crime thrillers. With three bestsellers in the same genre, there seems no surprise that Piyush Jha is the king of crime thrillers. Further, being a film director, he has a good sense of screenplay writing and every chapter of his books help you visualize the crime scenes when you read his books. The title does a good job throwing some light over what is inside, since the story revolves around a serial killer, who aims to be the best in his show. Book cover has been interestingly designed. A criminal’s face with a blood-stained knife portrays a scene after one of his series of murders. The book is soon-to-be motion picture and Piyush Jha as both writer and director will only help it. The book starts off quite interestingly with the introduction of the killer and the protagonist. The events the characters go through in their childhood times indeed build their path for the future and this has been beautifully put across by the author. 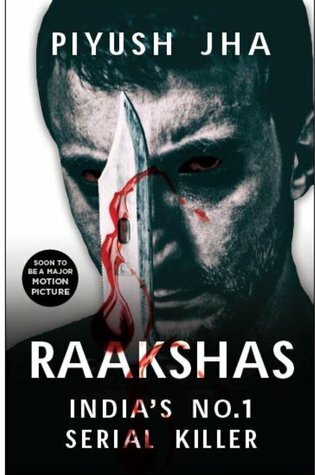 Raakshas is a story of a young boy who grows in an environment of hatred towards him. The author explains beautifully that ‘he was a murderer the moment he was born’ since his mother couldn’t survive the process. His father, who is busy with his research, sends him to stay with his aunt Latika but his uncle is indeed not happy with him staying with them. All this hatred and absence of love makes him concentrate on the negativities of life. Besides the killer dominating the story, the story also introduces Maithali, who is a success with academics but being a child, she also has something negative related with his past, but that secret remains with her for her life. Still, it haunts her at moments, but she emerges victorious by choosing a path of eliminating the crime in a bid to escape from the thoughts that tag her as a criminal. The author seems to have compressed a story into 200 pages what deserved to be a 400-page novel. Though the crime scenes have been given detailing and each killing an unique method of killing, several characters make an exit soon after their entry which goes unnoticed. By the time the last page of the book is turned, I indeed wished that the narration in the latter half was with similar detailing as was the introductory part, which set the stage for the story. The psycho-analysis of the killer, detailing of the events and the race towards being famous for the job throw much wanted lights on the complex turns and twists moving across the serial killer’s mind. He emphasises the fact to be known as the No. 1 serial killer and no less, and in fact, few of his killings are just an attempt to be known as the best. Another important aspect highlighted by the author in the book is the fragility of the relationships in our lives. ‘Handle with Care’ or the most beautiful relationship in our life might be gone sooner that one can even imagine. This is my takeaway from the book and certainly, something to be taken care of. However, the book describes the crime scenes and the violent killings and hence, the standard disclaimer goes without saying that such books are not for the tender hearted and especially not to be read when alone in night. But at the same time, the book connects you with the harsh realities of the real world. The book portrays the psychology of the serial killer quite beautifully and depicts each crime scene to its perfection. Not much of an avid reader, especially for crime thrillers, keeping me interested to complete the book is the biggest thumbs up for the author. The story is tends to lose its plot a little towards the end before the last scene, but this disconnect happens just for a little while though. Also, the pace of the book gets a little faster, leaving much wanted details. Piyush has indeed impressed me with his book which is my first amongst his four. I will rate this one a 4/5.